Schur, Nathan. Napoleon In The Holy Land. London: Greenhill, 1999. 224 pages. ISBN 1-85367-345-5. £18.95/$34.95. Hardcover. There are numerous books on Napoleon's expedition to Egypt that began in 1798 and ended with the eventual French surrender in 1801. They cover almost every aspect of the occupation from the campaigns to defeat the Mameluks, the naval and land battles against the British, and the scientific research which lead to the discovery of the Rosetta Stone, which unlocked the secrets of the ancient Egyptian hieroglyphics. Nathan Schur's book takes a different approach and examines the largely ignored subject of Napoleon's final campaign in the Middle East -- the invasion of the Holy Land (present day Israel, Lebanon, and the Palestine State.) The campaign was supposed to force the Ottoman Turks into making peace on terms favorable to the French and thus ensuring the security of the French colony in Egypt. Instead of an easy victory, Napoleon became embroiled in an unwinnable situation against a determined foe who refused to surrender. Although the French won numerous minor victories, the campaign foreshadowed the disaster of 1812. As in the invasion of Russia thirteen years later, Napoleon was never able to inflict a decisive defeat on his enemies and in the end was forced to make a harrowing retreat. Within two months of his return to Egypt, he boarded a ship for France where capitalized on his fame and glory to become the First Consul and eventually the Emperor of France. Mr. Schur covers all aspects of the campaign in the Holy Land from the initial preparations to the battles to the costly sieges, the diplomatic efforts, and the eventual retreat. He does a superb job describing the numerous battles and skirmishes, bringing to light information that has been all but forgotten. One of the major strengths of this book, is how Mr. Schur pinpoints the location of these battles and provides detailed terrain maps of five of the most important battles and sieges. In the case of the battle of Mount Tabor, where Napoleon defeated a force eight times greater than his own, the author pinpoints the exact location of the battlefield, something that others had not been able to do. Holy Land also explores in detail some of the incidents that caused so much negative publicity for Napoleon. These include the massacre of the prisoners at Jaffa and the poisoning of his soldiers who had the plague. In addition to these serious events, Mr. Schur also provides the occasional lighter piece of trivia. For example Napoleon gave General Junot full credit for the victory at the battle of Nazareth and in 1807, when he decided to make Junot a duke, Napoleon's first choice for a title was the Duke of Nazareth. Napoleon decided the "Junot of Nazareth might sound just a bit too like Jesus of Nazareth and thus Junot was created Duke of Abrantes (in Portugal) instead." The author closes with an appendix that has 25 pages of additional primary material relating to the events in each chapter. 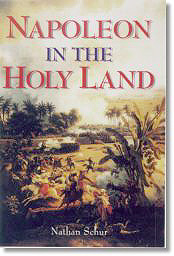 Napoleon in the Holy Land is meticulously researched and the information is well organized. It is an easy read and will keep the interest of both the avid historian and the casual reader. The only flaw I could find in this fine book is that it lacks orders-of-battle for both the French and the Turkish forces. Despite this short-coming it is a must read for anyone interested in Napoleon's campaigns in the Middle East.